﻿ How restaurant industry is getting disruptive: A round up! With over 500 + Restaurateurs in Presence and 100 + Restaurant industry Leaders and Chefs speaking at the congress, it was the biggest ever Restaurant show held in the country. Disruption is the current wave, focusing on the growth of Indian Restaurant industry in 2015. With many new food players entering the Unicorn club, “5th Annual Indian Restaurant Congress”, themed ‘Disruption’ discussed what has brought the biggest change in the industry, from government policies, technology, food safety, customer loyalty, design and all other elements which act as a catalyst for growth of the industry was discussed at the two days conference held on the 25th& 26thAugust 2015 at JW Mariot, New Delhi. Chaired by Sunil Kapur, Chairman, K Group, who while addressing the audiences at inaugural session, said, “Restaurant business is all about partnerships and relationships. The constant change with lots of innovation along with Recipe recreation, menu Tweaking, adaptation of trendy design and technology is a must for continuous growth in this business as eating out is a way life and not just an occasional treat. The show not only witnessed top Indian Restaurateurs and celebrity chefs but also The International Guest of Honor Enam Ali, Founder, Le Raj, The British Curry Awards & Spice Business Magazine from UK who Represents the interest of the Indian,Bangladesh, Pakistani and other Asian countries Restaurant leadership in UK was present on the occasion and he shared the issue of shortage of Indian curry chefs in UK, for which industry has made special request to UK government to bring flexibility in immigration laws, it will allow the industry to fulfill the demand, which is under threat of talent shortage. Commenting on the same Sh. Rajiv Pratap Rudy, Honorable Minister, Ministry of Skill Development and Entrepreneurship shared,“Restrictions on the immigration work force in United Kingdom is having an overall effect on the economy there. Shortage of trained workforce is seen all across the U.K. and is a major constraint for economic development. There have been references' earlier for giving permits to the curry chefs. This, in particular, is one important area where the shortage may substantially affect the taste buds of the people in U.K. India & U.K. have a traditional culinary connect, which shouldn’t be allowed to die out. Surely, if we get any requests from Indian restaurant owners our foreign office would be more than eager to approach the British Government”. How industry eyes this growth? Bizruption (Business Disruption)within the Restaurant industry, was the highest talk point of the conference, which is targeting a growth of CAGR 17 per cent annually followed by Youngruption(Young consumer disruption), where 50 per cent of the people eat outside at least eight times a month and the Techruption, (as Digital disruption) is peeping hot! With food-tech players getting thumps up from the investors. Addressing the audience with an overview of the restaurant and food industry, Riyaaz Amlani, President National Restaurant Association of India & MD, Impresario Entertainment & Hospitality added, "We're on the verge of our own renaissance. In terms of size-We're bigger than telecom and Bollywood industry only second to insurance and retail. The organized market is slated to be worth Rs. 167,000 Crores by 2018, which makes it all the more exciting to be a part of this industry right now. There are challenges acting as hurdles for aspiring restaurateurs, the biggest being government and regulatory issues. Many rules and regulations related to licensing, permissible drinking age, use of open spaces etc. are archaic and don't make sense today and need to be addressed immediately." 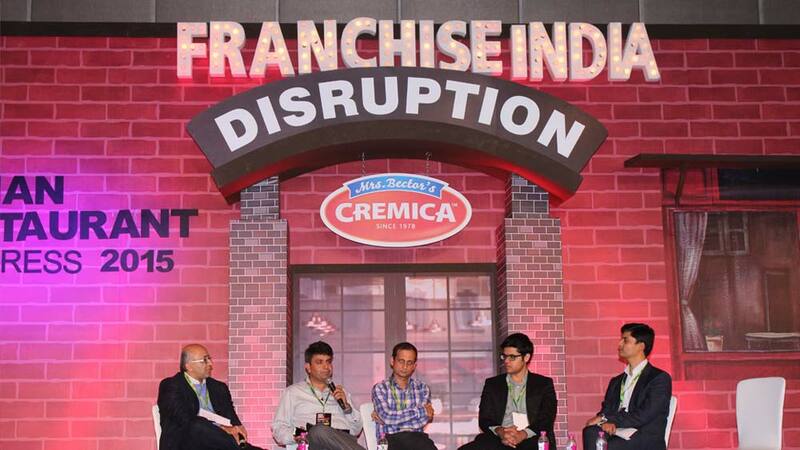 Priyank Sukhija, Owner,Lazeez Affaire Group said, “Restaurant industry is one such industry in India which is recession free and has brought the country on the world food map. Meanwhile we are continuously focusing on introducing new concepts and youth centric brand that can create entertainment along with food as eating out is no more a celebration in itself. Akshay Bector, Chairman & Managing Director, Cremica Food Industries Ltd. Commented that if industry has to scale up, bringing standardization in food is very important and this means that Restaurants should work on customization of their product to be able to take it not just in the Indian geography but across the world. Leading Investor’s and funding community presented at the show and talked on the real need for capital rising in the industry to which Pramod Arora said “Evolution is the key to survival but innovation is the road to success. Most service industries are moving ahead from mere survival tactics to innovative and sometimes disruptive approach. For the F&B and restaurant industry it's clear that's it's not only about an elegant dining experience but much more, it's about being a part of a performance and an experience to a happy meal." Other Prominent speakers, at the event included -Mohit Khattar, Managing Director & CEO, Nature’s Basket, Vikrant Batra, Owner, Café Delhi Heights & Café Terminus 1, Ashish Saxena, Executive Director & CEO, Tex Mex Cuisine India (Chili's- South & West India), Alpha Maiava, Franchise Sale & International Growth, Sumo International Inc. (Sumo Sushi & Bento), discussed food disruption. FoodRuption (Food+disruption) was discussed among top chefs including Master Chef Sanjeev Kapoor, Celebrity Chef, Entrepreneur, Masterchef Judge, Chef Vicky Ratnani, Culinary Director, Celebrity Chef and Author, Chef Manish Mehrotra, Celebrity Chef & Corporate Chef-Luxury Dining, Old World Hospitality Pvt. Ltd. While celebrity Master Chef Sanjeev Kapoor, Entrepreneur & Masterchef Judge lamented“Restaurant business has been consistent in my view though the return ratio is not very attractive because the money, the everyday effort that you put in this business doesn’t bring you a fruitful result always. However, I believe, ‘Efficiency’ in the business is the need of the hour”. While Chef J P Singh, Executive Chef, ITC Maurya-Bukhara shared that Bukhara maintains its menu over the last 25 years and that is its USP, while Chef Manish Mehrorata from Old world Hospitality who heads the award winning restaurant Indian Accent shared, ““Authenticity is a very subjective word and when you prepare food, similar dishes can be prepared in many ways, and it becomes really difficult to describe what authenticity of food is. At my restaurants, I never compromise on taste of the food. So, according to me, taste is the most important thing and after that you can do anything with the dish.” However, Chef Saby was of the opinion that Slow cooking needs to be re-looked at Restaurants once again as Indians would always continue to appreciate fine food. Open Spaces, Food Trucks, Tourist Hubs next big tr..